a) 20th October 2016, I started to wonder if this unused Alien logo done around the early stages of the Alien production was a starting point for Alien monster IV, inspired by production artwork. Michael Doret designed and drew the forms based on the bio-mechanical forms that he saw in some publicity stills from the production. It's as if elements of Delville's Treasures of Satan had somehow become absorbed in to the logo. The tendrils coming from the top of the devils wings have perhaps transformed into the row of tab like blades running along the top of the wing features on the top left that perhaps might actually be the octopus suckers at the end of the tentacle like wings moved to the front and the devil's zigzagging tail has transformed into the caduceus below the A in Alien. Since Michael Doret claims that he had never seen Treasures of Satan until I showed it to him, he obviously must be a talented man who just managed to conjure the right shapes to fit the general pattern, and well that's perhaps okay. He didn't think that it was likely that Giger had seen his work, and then we don't know that should be so either way. Michael Doret: Dear Wmmvrrvrrmm, I have never seen Jean Delville’s Treasures of Satan (until now). 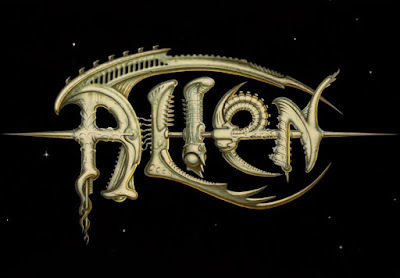 Any resemblance between that work and my design for the Alien title treatment is purely coincidental. In all likelihood Giger never saw what I did.